Littlehampton’s mayor has praised the ‘best-ever’ Screen on the Green event after a record attendance. On Friday night, East Green was packed with thousands of musical aficionados, who turned up to see The Greatest Showman, starring Hugh Jackman as P.T. Barnum. 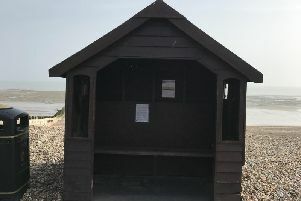 Littlehampton mayor Billy Blanchard-Cooper praised what he described as the event’s biggest-ever turnout, with around 8,000 people filling the seafront by the town council’s estimations. Around 2,000 people watched Jumanji: Welcome to the Jungle on Saturday night, he added. Billy said: “The atmosphere was fantastic when you walked around; everyone was enjoying themselves. Billy is no stranger to dressing up for events – he unveiled his drag alter-ego Miss Daniella Dream at Love Festival last year – but for the circus-themed film he wore a ringmaster’s outfit, featuring a jacket made by his friend Venessa Rose which he adorned with gold embroidery. Before the film on Friday, which started at 8.45pm, there were performances from hula hoop artist Lisa Sampson, a fire performance courtesy of Poi Passion and a stilt walker to keep people entertained. The mayor’s charity collection was organised by Tyndall Jones, and assisted by volunteers from Littlehampton’s Organisation of Community Arts and Stuart Capelin, the group raised a total of £1119.49 for Arun Youth Projects on Friday and £388.38 on Saturday – a record amount for the event, according to the mayor. Catering was also available from Dominos Pizza, Mexican restaurant Hey Amigo, the Littlehampton District Lions Club and Nic & Ben’s Entertainment.